Playing game is always a wonderful experience we all have and gamers will surely agree with it. No matter how stressed you are and how long and tiring day you had, only some favorite games on the best gaming console are enough to extract all the tensions. Games are the best way to keep you entertained in the best way possible. Most of the gamers set up a gaming room in their house and that’s the best place in their house where they spent the quality time. When we talk about the games and the joy we get, the first important thing we need is the gaming console. We all know about Playstation and nowadays the best gaming consoles of Sony are the PS4 and PS4 pro. Which one is better, PS4 vs PS4 pro? Gamers who are willing to have a Sony gaming console often like to know the comparison PS4 vs PS4 pro so that they can have the one that meets their needs. Gamers compare PS4 vs PS4 pro as both consoles are from Sony, which is a well-known brand that has been selling the best gaming consoles and other products for so long that now they have made a really strong position in the market. PS4 vs PS4 Pro, What is the difference? The most prominent thing that made PS4 pro different from PS4 is the resolution. 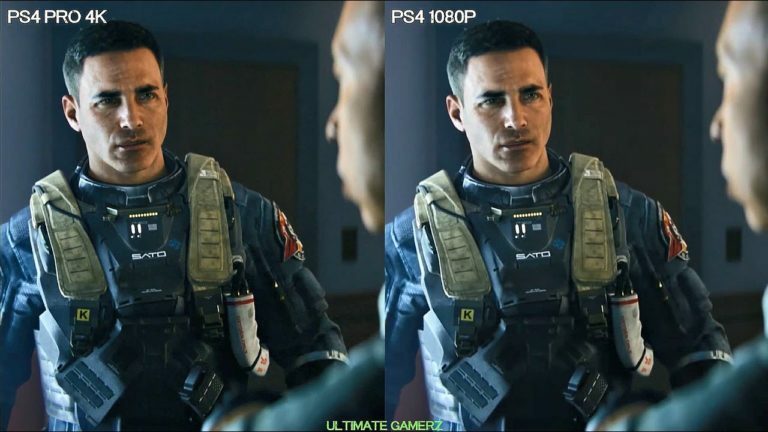 PS4 is capable of displaying 1080 pixels while PS4 has the ability to even go as high as 2160 pixels, which is most commonly known as 4K. So, you can get the 4k result with the PS4 pro. The thing you need to know is that games need a PS4 pro patch to enable the more detailed resolution that you are willing to get for the outstanding gaming experience. The game you want to play should have a Pro mode so that it works on the pro hardware with the resolution you want. PS4 pro is capable of displaying a 4k resolution and ultra-HD media streaming from popular apps like Netflix. Both gaming consoles have a lot in common, yet the differences make them stand apart. PS4 and PS4 pro both are somewhat similar, except for a few prominent features. But the reality is both are perfect for gamers. Storage 500 GB (5,400rpm) replaceable hard drive. 1 TB replaceable hard drive. One of the best ways to tell which Playstation is best is to check the features. The more advanced features, the more outstanding gaming experience you have. Gaming consoles have many features that surely provide comfort while playing and also provide the best gaming experience. PS4 pro being an advanced Playstation has some great features. It has an upgraded processor, which is better than PS4. PS4 pro has a processor of 2.1GHz 8-core AMD custom “Jaguar” CPU with Integrated AMD Polaris graphics with 4.2 teraflops of performance. Whereas PS4 has a processor of 1.6GHz 8-core AMD custom “Jaguar” CPU with Integrated AMD graphics clocked at 800MHz with 1.84 teraflops of performance. Moreover, the PS4 pro delivers a 4k resolution that takes your gaming experience to another level. On the other hand, PS4 does not deliver a 4k resolution, you can get the resolution up to 1080 pixels. The storage capacity of the PS4 pro is more than PS4. The PS4 pro features 1 terabyte replaceable hard drive while PS4 features 500 GB replaceable hard drive; one TB equals to 1024 GB. Furthermore, PS4 pro features dynamic 4k gaming experience, HDR display, deep shadows, vivid textures, and anti-aliasing. With PS4 pro you will get a more detailed view as if you are into the game and playing yourself. The appearance of PS4 and PS4 pro is a bit different that can even be seen with the naked eye. The most notable difference is the extra layer onto the console of PS4 pro. The PS4 has two layers and the gap between layers for the ports and disk drive. The PS4 pro has three layers and a sleeker finish on the top. It does not increase the size and dimension of the console much. The PS4 has a weight of 6.2 pounds with a dimension of 12. x 10.8x 2 inches, while the PS4 pro is having a weight of 7.2 pounds with a dimension of 12.8 x 11.6 x 2.1 inches. PS4 pro is definitely bigger as compared to PS4, but not by much. Plus, PS4 pro is only one pound heavier. The highlight is that PS4 and PS4 pro both systems are having Blu-ray drives. Both gaming consoles lack 4k Blu-ray playback. PS4 pro was supposed to have an ultra HD Blu-ray player, but Sony did not include this feature. The PS4 pro is capable of playing HD Blu-ray discs having 1080 pixels similar to the PS4. Gamers get puzzled when Sony made a decision to omit ultra HD Blu-ray drive from PS4 pro considering that it can be a boon. Gamers are having an opinion that Sony may add this feature in the new gaming console. In terms of the connections, the PS4 pro and PS4 are somewhat identical. The only difference is the extra USB port included in PS4 pro, which proves to be an advantage for the gamers. This extra port is useful if you are willing to use the VR as your headset needs a port to plug in. The inclusion of an extra port in PS4 pro is outstanding and also appreciated by the gamers as the move controllers need a port to charge. The PS4 pro gaming console has an optical audio output. Another difference between PS4 pro and PS4 is the HDMI port. PS4 pro has an HDMI 2.0 port while PS4 has a 1.4 HDMI port. The 2.0 port of PS4 pro is perfect for 4k resolution. Additionally, there is a point that you need to note that you do not need to upgrade the HMI cable to have a 4k display. In fact, you can use any HDMI cable, which is capable of displaying 1080 pixels. If a cable can handle 1080 pixels, it can also deliver 4k display, so no need to upgrade the HDMI cable. The main reason to have PS4 pro is that it supports the 4k output, while PS4 is capable of displaying 1080 pixels. The PS4 pro supports media streaming such as Netflix but it is capable of displaying TV shows and movies in their maximum resolution only. Due to the lack of Ultra HD Blu-ray drive, it will not be able to 4k media. A major difference can be seen by looking at the internals of both gaming consoles. The fact to be considered is that both gaming consoles have a CPU of MD Jaguar x86-64 8-core, and an increase can be seen in the clock-speed from 1.6 GHz to 2.1 GHz. Apart from the CPU difference, the PS4 pro has a better GPU performance. The power and clock-speed have been increased from 800 MHz to 911 MHz. PS4 has a GPU 1.84 teraflops, while PS4 pro has a 4.2 teraflops GPU. Moreover, PS4 pro contains 1 GB DDR3 RAM. The Wi-Fi of PS4 pro is also upgraded having Bluetooth v4.0 and 802.11ac Wi-Fi antenna. PS4 pro features a boost mode and the purpose of this mode is to increase the frame rate in games that have not received the pro patch. Basically, it boosts the performance of the games of PS4 when played on PS4 pro. So, you can get a perfect result, even if your game does not have a pro patch. There are many games that have not received the pro patch and working really good on PS4 pro such as Assassin’s Creed, Project Cars, and Battlefield 4. There is not a bigger difference between both gaming consoles in terms of VR performance. Some games display the similar result in both gaming consoles. But there are some games that work better on PS4 Pro as it shows a detailed and sharper view all thanks to the developers who have enabled the super-sampling techniques. So, it can be said that PS4 pro proffers an improved VR experience. As you have noted the features of PS4 vs PS4 pro, it is quite evident that PS4 pro has more in store as compared to the PS4. And we all know that if we need more features, then we have to pay more. Both gaming consoles are available on Amazon and some other sites or you can go to the market to get the console you like the most. If you buy online, you may get some discount offer. Both ways are good to buy a Playstation. PS4 is available at a reasonable rate, which is $300. On the other hand, PS4 pro cost you $400, which is definitely higher than PS4. PS4 vs PS4 Pro, Which One Is Better? We see the difference between both gaming consoles in every aspect be it connectivity, internals, features, appearance, optical drive, VR performance, 4k TV performance or boost mode. PS4 pro is an advanced and upgraded gaming console that is capable of delivery 4k out, while PS4 can only support HDR. PS4 pro has a boost mode that is definitely a boon as you can play your game with a boosted performance in PS4 pro even if it has not received the pro patch, which is an added advantage for sure. Moreover, the RAM, CPU, and GPU of PS4 pro are better than PS4. The PS4 pro has an extra USB port which is really useful for the gamers who want to use the VR as it needs a port to plug in. Moreover, PS4 pro has an optical audio output and an HDMI port of 2.0. Coming to the VR performance, PS4 pro offers better performance and it is also a fact that some games show similar performance in both gaming consoles. So, if you want a gaming console to have a 4k resolution with more features, then the PS4 pro is the right one for you. In fact, it is best for delivering 4k output. But, you need to pay more for more features and 4K output. If you want to buy a reasonable gaming console with 1080p resolution, then PS4 is definitely best for you.